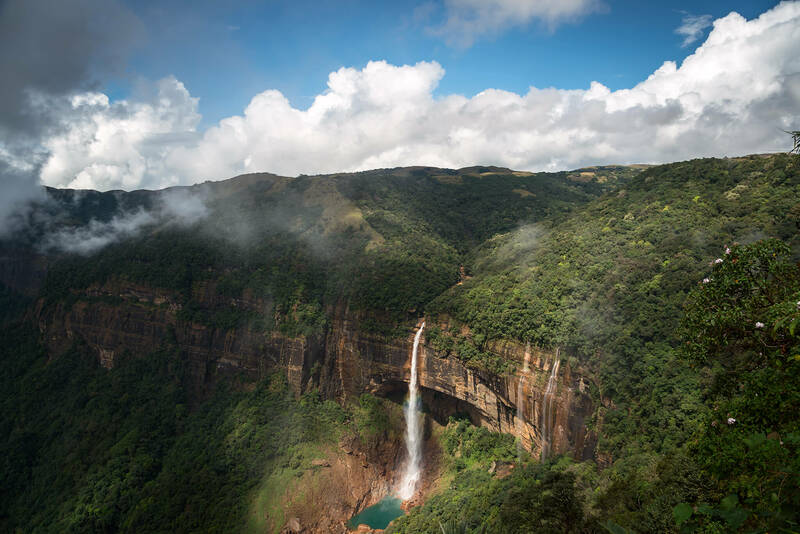 Nohkalikai Falls - Cheerapunjee, Meghalaya, India. Nikon D800 + Nikkor 24-120 lens used to take this shot. The name of the falls in Khasi language meaning "Jump of Ka Likai" is linked to a legend about local women Likai who jumped off the cliff next to the falls; According to legends, in a village called Rangjyrteh, upstream from Nohkalikai Falls, a woman named Likai resided but had to remarry after her husband died. Ka Likai (Ka is the prefix given for the female gender in Khasi) was left with her infant girl with no means of income. So she had to become a porter herself. Her work required her to leave her daughter unattended for long intervals but when she would be at home she would spend most of her time taking care of her infant. Ka Likai, who married a second time, couldnât pay attention to her second husband. The jealous husband killed the infant and cooked her meat after throwing away her head and bones. When Ka Likai returned home, she saw nobody in the house but except for a meal that had been prepared. She wanted to go look for her daughter but she ate the meat as she was tired from work.